About 61% of the voters surveyed were from rural areas, while 39% were from urban areas, an ADR report says, adding, 66% were males and 34% were females, 73% were from General category, 16% ST, 6% SC, and 5% OBC. The survey covered approximately 13,000 respondents across all 26 parliamentary constituencies of Gujarat. The three main objectives of this survey were to identify the following: (i) voters’ priorities on specific governance issues, (ii) voters’ ratings of the government's performance on those issues, and (iii) factors influencing voting behaviour. This survey was conducted between October 2018 and December 2018, prior to the General Elections to the Lok Sabha 2019. Focusing on Gujarat, this report provides an analysis of 10 most important governance issues as rated by the voters of Gujarat. These voters’ priorities are further examined in relation to the performance of the Government on those issues as perceived by the respondents. The key objective of this perception assessment is to provide an improved understanding of the important expectations of voters from the Government and how they assess its performance. In addition, it seeks to fill a vital gap in contemporary times, namely, evidence-based research and action on governance. For far too long we have depended entirely on ideology or the opinions of various experts. Though that is important, we also need to reflect on the priorities of the voters. These priorities and assessments will change over time, and hence there is a need to repeat this survey periodically. Better Employment Opportunities (42.68%), Drinking Water (37.12%), and Better Hospitals/Primary Healthcare Centres (30.23%) are the top three voters’ priorities in overall Gujarat. The performance of the government on all top three voters’ priorities of Better Employment Opportunities (2.33 on a scale of 5), Drinking Water (2.60), and Better Hospitals/Primary Healthcare Centres (2.62) was rated as Below Average. 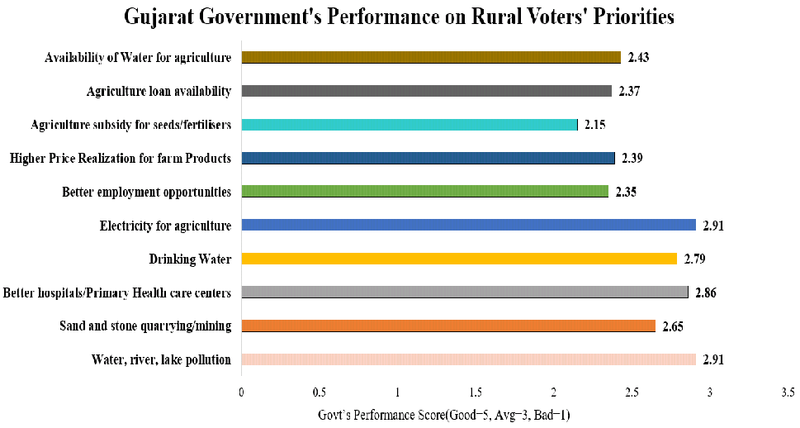 In rural Gujarat, top most voters’ priorities were Availability of Water for Agriculture (46%), Agricultural Loan Availability (45%), and Agricultural Subsidy for Seeds/Fertilisers (44%). The performance of the government on rural voters’ priorities of Availability of Water for Agriculture (2.43 on a scale of 5), Agricultural Loan Availability (2.37), and Agricultural Subsidy for Seeds/Fertilisers (2.15) was rated as Below Average. 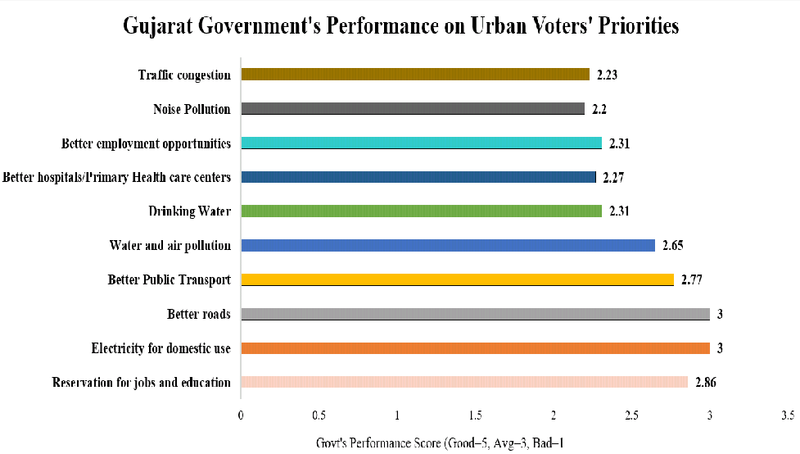 For the urban voters in Gujarat, the top most priorities were Traffic Congestion (49%), Noise Pollution (47%), and Better Employment Opportunities (45%). 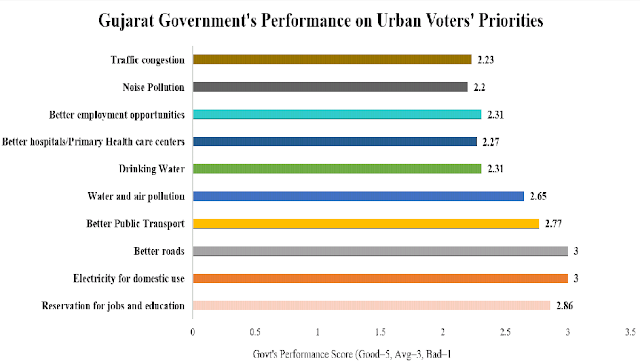 The performance of the government on urban voters’ priorities of Traffic Congestion (2.23 on a scale of 5), Noise Pollution (2.20), and Better Employment Opportunities (2.31) was rated as Below Average. The survey tried to analyse the following aspects with respect to voting behaviour – (i) factors influencing voting behaviour, (ii) opinion regarding criminal candidates contesting in elections, and (iii) voter awareness regarding the role of crime and money. To identify the factors that influence voting behaviour following queries were posed – “What are the reasons you vote for a candidate?” and “In an election, whose opinion mattered the most while deciding which candidate to vote for?”. In order to comprehend voters’ opinion regarding criminal candidates contesting in elections, the two questions that were posed were – “Should someone with a criminal case be in Parliament or State Assembly?” and “Why do people vote for those with criminal records?”. To assess voter awareness regarding the role of crime and money, the following questions were asked – “Do you know that distribution of cash/money/gifts etc. are illegal?”, “Are you aware of instances of distribution of cash/money/gifts/liquor in your constituency during the last election?”, and “Do you know that you can get information on criminal records of the candidates?”. Highest percentage of voters said PM candidate was the most significant reason (Important: 42% and Very Important: 39%) in voting for a particular candidate in an election. This was followed by the Candidate’s Party (Important: 53% and Very Important: 25%) and the Candidate himself/herself (Important: 54% and Very Important: 14%). For 20% voters, distribution of cash, liquor, gifts etc. was an important (14%) and very important (6%) factor in voting a particular candidate in an election. While deciding which candidate to vote for in an election, 83% of Gujarat voters stated that their own opinion mattered the most, followed by voters for whom opinion of their Family Members (7%) and Spouse (5%) mattered the most. A large number of voters (64%) knew that distribution of cash, gifts etc. are illegal. About 35% voters said that they were aware of instances where such inducements were offered to the voters in return for their votes. 98% voters felt that candidates with criminal background should not be in Parliament or State Assembly.Only 42% voters knew that they could get information on criminal records of the candidates. In relation to voting candidates with criminal antecedents, 38% voters felt that people vote for such candidates because candidate otherwise does good work. 37% voters said people vote for such criminal candidates because he/she had spent generously in elections. Caste and religious considerations are also key factors for 36% of voters in choosing candidates with criminal records. Other important factors in voting for criminal candidates were that voters’ felt cases against such candidates are not of serious nature (36%), voters’ were unaware about the criminal records of the candidate (36%) and because candidate is powerful (34%). The Gujarat Survey Report 2018 points to the fact that voters’ priorities in Gujarat have been neglected by the government in power. This is quite clear from the fact that the government has performed poorly and underwhelmingly on almost all top 10 governance issues as rated by the voters of Gujarat. Are decisions related to public policies in different spheres like infrastructure, social and economic development etc. made in favour of certain sections of the society at the expense of overall social welfare? Is there a need for the Government to reallocate/plan budget expenditure as per the voters’ priorities? How can political parties be made more accountable in delivering on the promises made i the manifesto? What policy changes need to be made to provide employment, better health care and drinking water to the deprived sections of the society? The fact that the electorate has no role once the politician has been elected, allows the priority of the elected candidates to be determined by the political parties. It is then hoped that the electorate takes care to elect a better politician to represent them. Political representation is about making constituents’ preferences present in politics and governance. Behind these ratings is the daily reality that people living in our country face. The ratings try to capture this and help inform our Government what that number means and how the Government is perceived by the voters of this country.